Ok guys, starting a new thread here. I'm starting work on my '83 xr200r again. Going to turn it into my practice bike. It runs great, engine runs good, no issues with the carb or anything. However the suspension seems a little tired. I've noticed that whenever I sit on it, it usually sits kinda low. Also if I'm riding and I hit a small bump or dip in the road, I can hear some sort of clanking, I think it's bottoming out. It feels like the rear shock/spring is too soft or weak. I've already rebuilt the forks once, and they seem ok. Only question I've got for the forks is am I supposed to add air in these forks or are the little valves for bleeding air? I've heard both so I'm a confused. I consider myself a bigger rider, I weigh 215 and am 6'5". Am I just too big for the bike? Thanks guys. 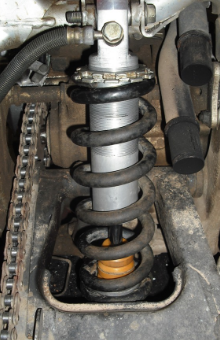 Your rear shock should look similar to pic. At top there is two notched collars which adjust the length of the spring. Loosen the upper locking one, then wind the other one down to compress the spring more and tighten lock ring. But crank up the spring preload and see what happens first. Your rear shock is probably pretty tired by now and you are a big guy. The rear shock on that bike is rebuildable so it can be worked on. I would imagine by now that most of the nitrogen has leaked out. Maybe a heavier spring and a recharge will get you by. I don't have a clue what spring rate is on that bike , maybe someone else knows. Yeah mine looks like that, however the spring looks a little different. It's got more coils in it, so maybe it a softer spring? It looks like it's been changed, unless stock spring where pink? And on the front forks are they air assist forks or are the little valves on them for bleeding air of some kind? I have to disagree with you on this one. The valves are for adding air, including the 83 cr250. The service manual for my 85 cr250r calls for a max 6psi. The air was a bandaid fix for soft suspension . Generally you only had a couple of spring rates to choose from. If you were a big guy or taking huge jumps adding a little could help with the bottoming. Normally air was the last resort. Ok guys I did some work on the xr yesterday. First I took the rear tire off and fixed the rear drum brakes. They weren't returning and needed a freshening up. I did like you guys recommended in my other thread and lubed the cam, and what a difference! Also increased the tension on the rear spring. That made a world of difference. I sat on the bike and it didn't sag like a chopper, which was good. I then rode it around on whatever terrain I could find (dips in the road, some small bridges) and it didn't bottom out like it used too. I tried adding air in the front forks but I think the valve stems are no good, they leak. Going to replace those. Now I gotta get used to using the rear brake! It's a little hard to reach, the (pedal?) is kinda small and close to the engine, almost under it. But I'll get over it. Overall I'm happy with it now, I see what you guys mean by the front forks being soft, they are constantly moving, even on level ground. Also noticed the carb on this bike is a Keihin. Was that stock on these? I thought all these old bikes where Mikuni? Honda used the keihin carbs forever. It should be stock. The forks and shock need fresh oil. I would try 10wt oil in the forks. Ok just wanted to make sure. I started work on the front brakes, took them apart, lubed the cam and stuff. The front forks where rebuilt by yours truly about 2 years ago, the oil is pretty new. I believe I have 10wt in them right now. I wonder, if I put a heavy thick oil would that make them stiffer? Yes it will but 10wt is already pretty stiff. 20wt used to be available but I haven't seen any in a long time. Google PJ-1, they used to have it and they are a quality brand. Thicker oil mostly helps slow things down ,more so on the rebound . I know 15 is still available i just put some in a ttr230 along with some stiffer springs. Ok. I mean they don't really bottom out, they have about 4-6 inches of travel from what I've seen. I hit a pretty good sized dip when I was testing it and the forks traveled only 6 inches, not too bad. I know this because my boots don't stay put, they slide up. I'll slide them all the way down before a ride and when I get back, I'll see how far they got pushed up. That's how I know how far they traveled. I should probably get new boots huh? I'll have to try some rougher terrain and see what happens. We've got a field that was recently disced and leveled, so it's not smooth at all. That'll give the suspension a good workout. I'll report back what I find. The boots should be staying in place and not moving. Something wrong there. Yeah they're for a 125 or something I think. I ordered them off eBay, they where too small I think. I remember them being a complete pain to put on, then realizing they where for the wrong bike.